More than two months after popular comedian, Bright Okpocha, AKA Basketmouth, was robbed in his home at Lekki, Lagos, the police have apprehended and paraded the suspects involved in the attack. The leader of the three-man gang who attacked Basketmouth, 24-year-old Chibuzor Ugwu, explained that they simply stumbled on the comedian’s house during their robbery spree on September 7. 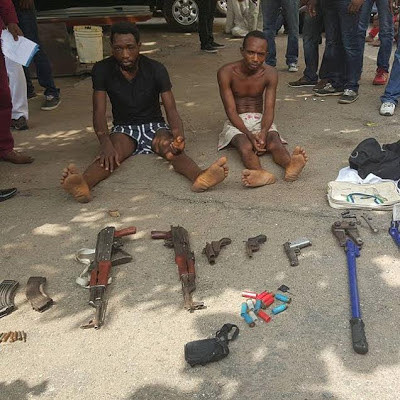 Ugwu, an Enugu State indigene living in Anambra State but came to Lagos regularly on the sole mission of carrying out robberies, explained that he was an internet fraudster for three years before he ventured into robbery. “Anytime I came to Lagos, I took my gang to vandalise vehicles and steal auto parts. We normally targeted Toyota and Honda vehicles. “But the day we robbed Basketmouth’s house. We had operated on some vehicles in the area that day. We then peeped into a compound and saw a very nice car. When we gained access into the compound, we realised we could make more money by robbing the occupants of the house. According to Ugwu, who said he had done nothing else than internet fraud and robbery since he left secondary school, as soon as they saw Basketmouth, they believed they had hit the mother lode. The suspect said he pointed a gun he was holding at the comedian and told him to cooperate. He said they were shocked the comedian told them he had no cash at home. “We thought we were going to find millions of naira at the house. He was begging us not to hurt his family. He said he did not keep cash at home. But we told him to cooperate so that we would just operate peacefully and leave. “We searched the whole apartment and found nothing. We only got a $200 note in his wallet along with the mobile phones in the house which he handed to us. He said the phones collected in Basketmouth’s house were sold to a friend he identified as Osama at the Computer Village in Ikeja. Ugwu explained that he bought the gun he took to the operation for N80,000 in Benue State.